Bitcoin was created for one purpose alone…transactions. Bitcoin was able to show the world that a payment system can exist on a decentralized peer-to-peer system. However, what goes on behind the scenes of these transactions? Behind every little transaction, there is some code working in the background. This code is the Bitcoin Scripting Language or just Bitcoin Script for short. 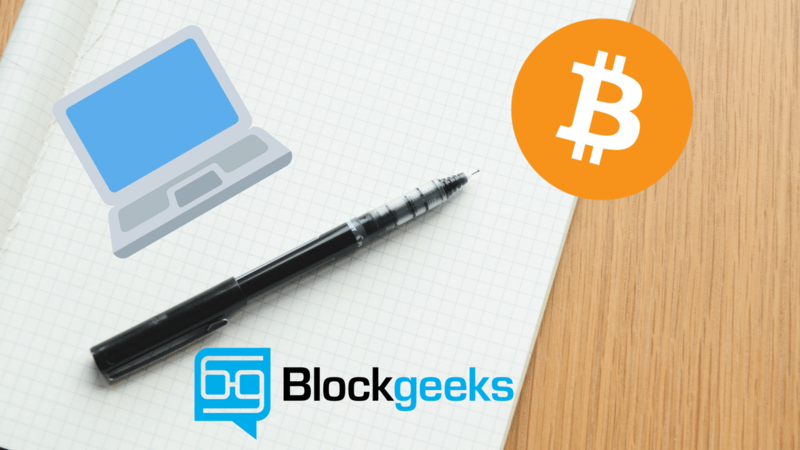 The aim of this guide to help you understand the logic behind Bitcoin Script. Since there will be too much to cover, the guide will be divided into two parts. Script is a Forth-like, stack-based, reverse-polish, Turing Incomplete language. Yes, that sounds very complicated, but it really isn’t. Let’s go through each and every term from reverse. A Turing Incomplete language will have limited functionality and not be capable of making jumps and/or loops. Hence they can’t enter an endless loop. Being Turing Complete means that given the resources and memory, a Turing Complete program will be able to solve any problem. Solidity is an example of a Turing Complete language. So why isn’t Bitcoin Script Turing Complete? Because it doesn’t need to be. Bitcoin Script doesn’t need to be as complicated as an Ethereum smart contract. In fact, if a script was Turing Complete, it would have given malicious parties the freedom to create complicated transactions and eat up the hash-rate of the Bitcoin Network and slow down the entire system. Reverse polish notation is a system where the operators follow the operands. 3+4 will appear as 34+. 5*3+4 will appear as 534+*. Stacks are one of the most popular data structures out there. According to Wikibooks, they can be logically thought of as linear structure represented by a real physical stack or pile, a structure where insertion and deletion of items take place at one end called top of the stack. What was the first book that was put on this stack? Lone Wolf & Cub right? What was the last book? Gardens of the Moon. 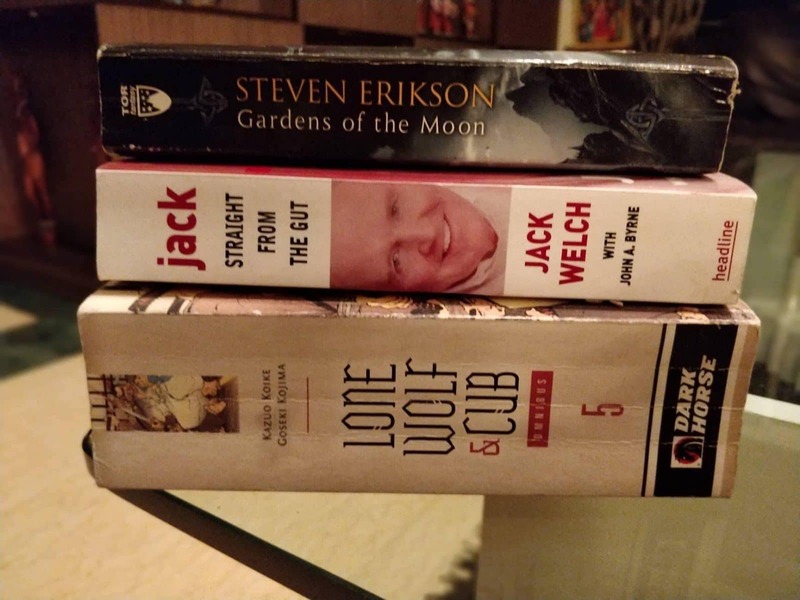 If one were to take out a book from this stack, Lone Wolf & Cub won’t be the book you take out first, Gardens of the Moon will be the first you take out. Hence, Last In First Out. The Last book that went on this stack pile will be the first book taken out. 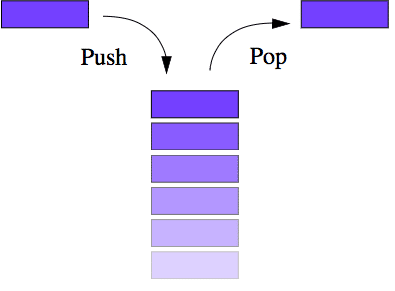 Push: The act of adding things into the stack is called pushing. Pop: The act of removing things from the stack is called popping. As has been mentioned before, the last item which got pushed into the stack gets popped out first. This one is pretty straight-forward. 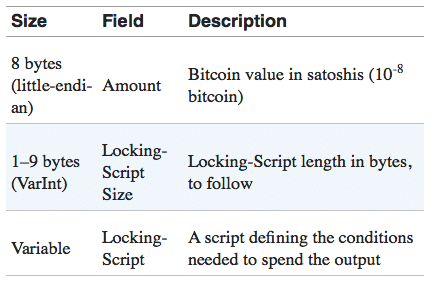 Bitcoin Script happens to resemble the programming language “Forth” which also happens to be stack-based. So, now we at least know what script is, let’s understand how Transactions work. The output basically will have the number of bitcoins that Bob will possess, post-transaction and any remaining change that is left over, which is then sent back to Alice. This change then becomes her input value for all future transactions. 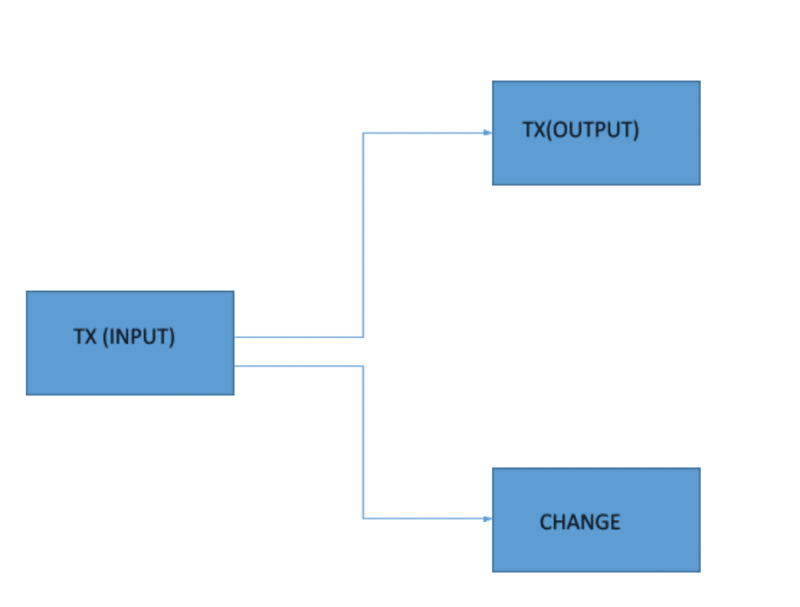 Transaction fees = TX(Input) – (TX(output) + Change). 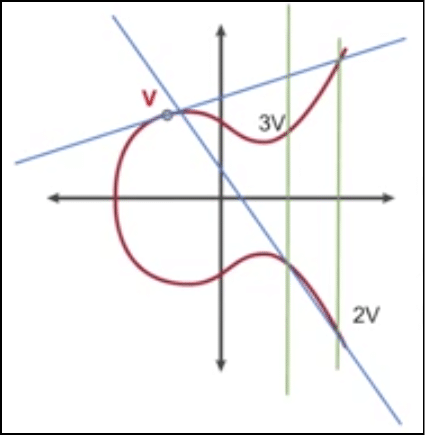 TX(0) + TX(1) + TX(2) = TX(Input). If Alice doesn’t have the funds necessary to carry out the transactions then the miners will simply reject the transactions. So, now lets a look behind the scenes and see what the transaction actually looks like. This is what the transaction looks like in the code form. As we have seen above, every input in a transaction turns into outputs, some of these outputs are spent, while some are unspent and becomes change. This change is also known as UTXO or Unspent Transaction Output. 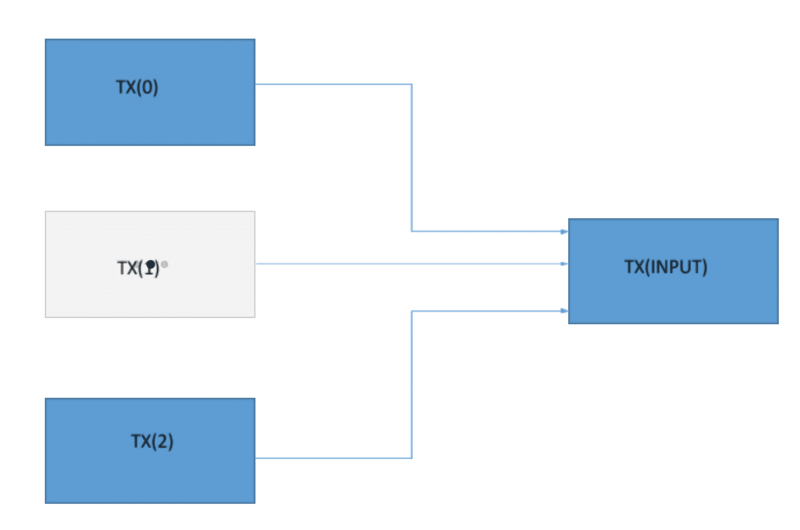 UTXO goes on to become Inputs in future transactions. The value of that output. The cryptographic puzzle which either called a locking script, or a witness script or a scriptPubKey. The puzzle needs to be unlocked in order to spend the money. This puzzle is coded using the Bitcoin Script language. "scriptPubKey": "OP_DUP OP_HASH160 ab68025513c3dbd2f7b92a94e0581f5d50f654e7 OP_EQUALVERIFY OP_CHECKSIG"
Now let’s looks at the other side of the coin, the transaction inputs. Which UTXOs will be chosen for this transaction? That ‘s correct, A and B will be chosen, and whatever is left over will become the UTXO for Alice’s next transaction. Now, let’s look at an input code. scriptSig: As we have mentioned before, each UTXO contains a locking script. The scriptSig includes the data necessary to unlock the data. sequence: Was included to help people update their transactions before they are confirmed and finalized in a block, Not really that relevant to help understand the basics. In the previous two sections, we saw a simple one input and one output transaction. if we were to serialize it and store it in hexadecimal format, what would it look like? Yup, this author didn’t accidentally bang his head on the keyboard here… that’s what it actually looks like. However, don’t get scared. We will make sense of it soon enough. Somewhere in that hexadecimal stream, we have out input data and our output data. Let’s find both of them! Now, what data about the output do we actually know? There are two output values. In hexadecimal 1,500,000 is 16 e3 60, which when coded in little-endian i.e. least significant byte first notation gives 60 e3 16. The scriptPubKey length is 25 bytes, which is 19 in hexadecimal. So, take note of these pieces of information, let’s search for our output data. Now can you locate the input of her transaction? Alright, so what have we seen so far? 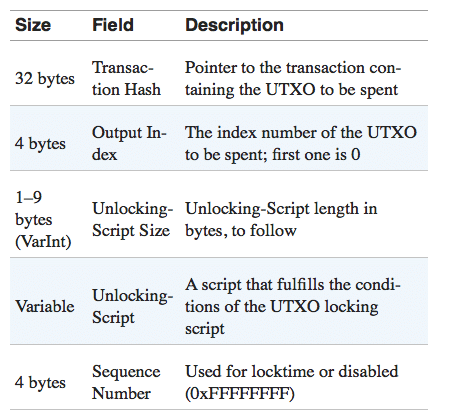 The outputs of a transaction and the UTXOs. The inputs of a transaction. How the entire transaction is being serialized. Now, we know that UTXOs can only be used if they are unlocked. We know that input values have scriptSig which helps unlock them. How do they interact with each other? Before we get to that though, we should have an idea of how calculations and operations happen in a Bitcoin script. Before we continue with Script, it will be helpful to understand how a stack-based, reverse-polish system works. 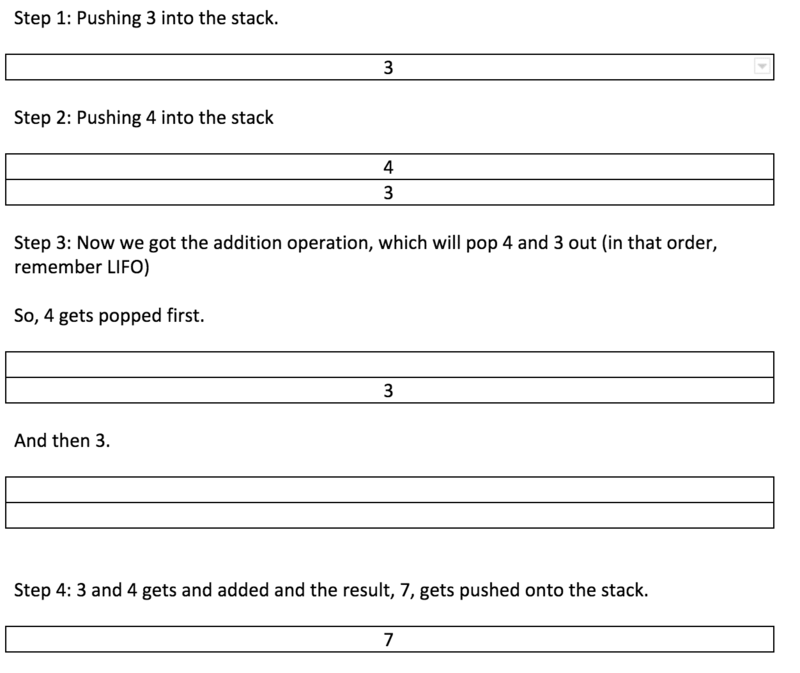 As we have said before 3+4 in reverse-polish will look like 34+, let’s execute the addition operation using a stack. 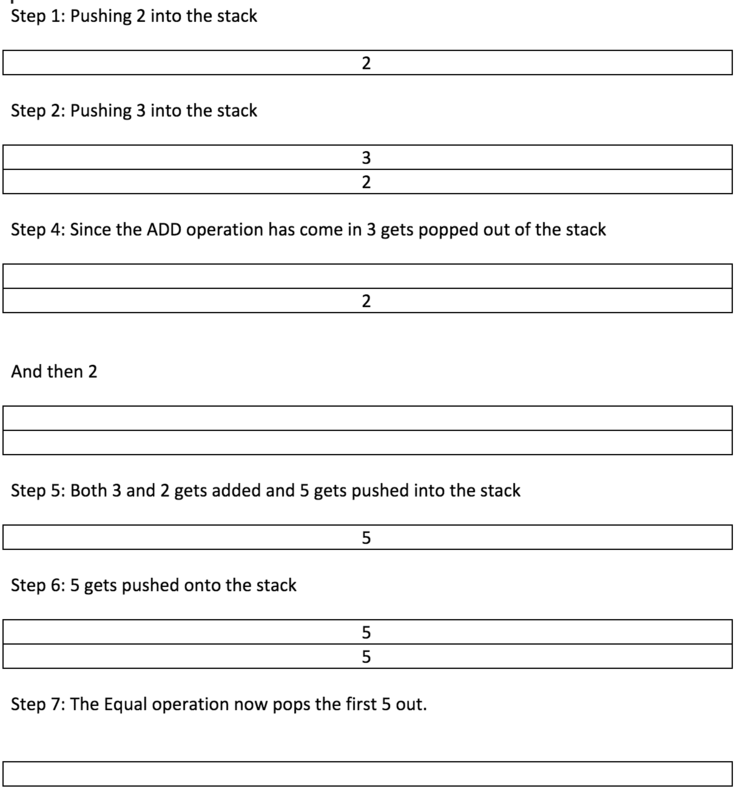 That’s how a simple addition operation gets done on the stack. Now that this is done, how would this look like if it were a script? If you want a primer on the different Opcodes that are used in a script then click here. Now suppose we want to do 2+3=5. In Reverse Polish it will look like 23+5=. Now, what would have happened if we used the postfix VERIFY in EQUAL? Meaning, instead of OP_EQUAL we used OP_EQUALVERIFY? This is what happens when you append “VERIFY” to an opcode. Keep this in mind for future examples. Alright, let’s take one last example. We are taking this example just to introduce you to an extremely important opcode, DUP aka duplicate. Let’s, we want to push a number into a stack, duplicate it, and see if the two numbers are same or not (which it obviously will be). Transactions in Bitcoin are a constant game of locking and unlocking. The UTXOs are locked up by the scriptPubKey while the inputs of the transaction contain the scriptSig. The idea of scriptPubKey is to offer a cryptographic puzzle which can only be unlocked via the corresponding scriptSig. So, what exactly happens and how is this game played? Suppose, Alice wants to send Bob some Bitcoin. Bob’s public address is common knowledge and she will send her Bitcoins to Bob’s public address along with a condition, Bob must prove that it is indeed him who is getting the Bitcoin. Now, let’s go back for a bit, and revisit some basic concepts. The public key is cryptographically derived from the private key. Now, in order to get money sent to them, everyone must have a public address. The public is run through two hashing algorithms, SHA-256 and RIPEMD-160. The reason why we do this is to make sure that you have an extra layer of protection, IF in the case that someone somehow figures out how to generate your private key using your public key (which is infeasible). Note: The public key first goes through SHA-256 to give a 256-bit output hash, and then that hash is run through RIPEMD-160 which gives a 160-bit output hash. So, the final output is a 160-bit hash. Alright, so Alice will send the money to Bob’s public address along with a condition that Bob must show a proof, that it is indeed him who have gotten the money. The proof that Bob uses to unlock the funds is his Digital Signature, which cryptographically derived from his private key. Think of the transactions that Alice sends Bob as a locked chest, and Bob’s signature as the passcode. Now, getting back to our script. Note: How OP_HASH160 and OP_CHECKSIG works will be clear to you soon. 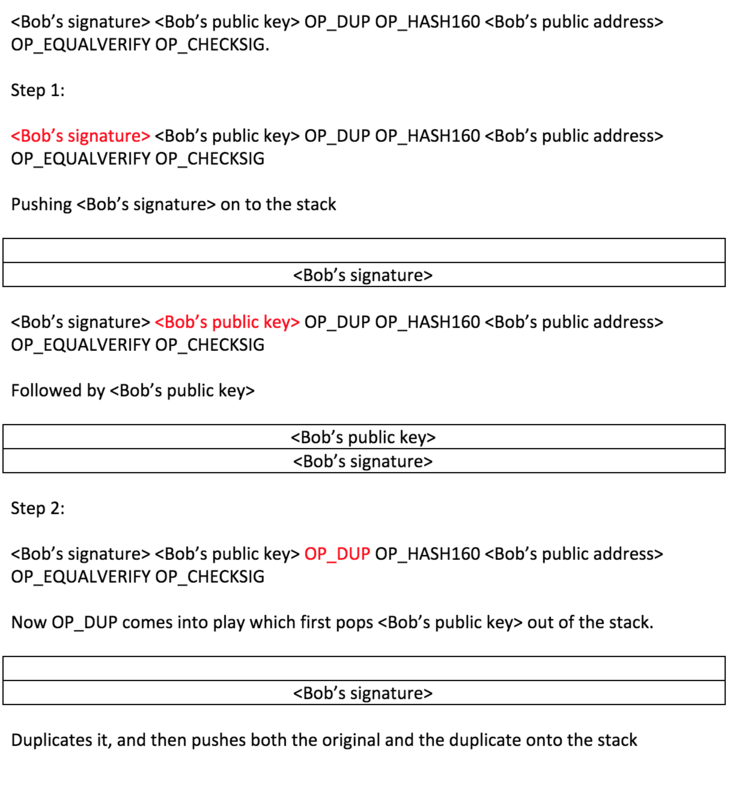 The OP_CHECKSIG pops out <Bob’s public key> and <Bob’s signature> and checks to see their validity to know that they are valid signatures and public addresses. When this entire process is done, Bob can unlock the transaction and gets access to his funds. Congratulations! You just went through an entire Bitcoin transaction! So, what is this mysterious CHECKSIG operator and how does it work? Well, for that we need to look at the cryptography behind bitcoin. In order to know how CHECKSIG works, we will need to know what a digital signature is. A digital signature is a digital code (generated and authenticated by public key encryption) which is attached to an electronically transmitted document to verify its contents and the sender’s identity. 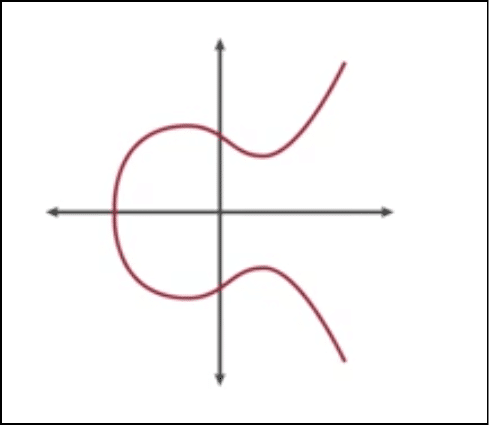 The digital signature algorithm used by Bitcoin is ECDSA or the Elliptical Curve Digital Signature Algorithm. They have inverses aka reflections. Whilst multiplication is fast, division is very slow. Suppose we have Q = nP and we want to find the value of n by dividing Q by P. We can’t really do that. We will have to manually go through the numbers one by one to find a value which satisfies the equation. This makes it very slow. 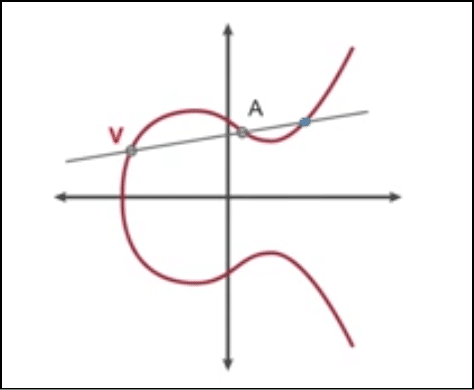 This is called the discrete logarithmic problem and this is what gives the curves its trapdoor function i.e. it is easy to multiply n and P to get Q but given Q and P, it is infeasible to get n.
Before we see how the process works let’s check out certain variables and their meaning that we will be using in the following equations. Ok, so now let’s see how the maths behind the verification work’s. Public key Q = dG. (it is impossible to get the private key from Q and G because of division in infeasible). The reason why we generate r and s is that these are the coordinates of our signature. 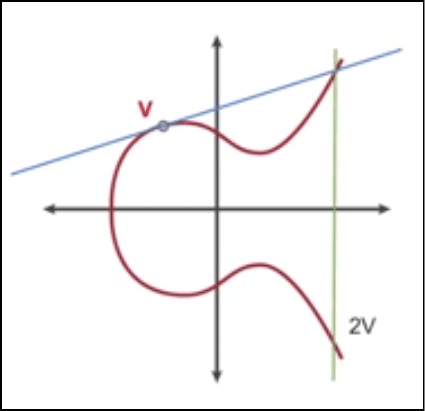 Now, the verifiers can simply compare the x coordinates. 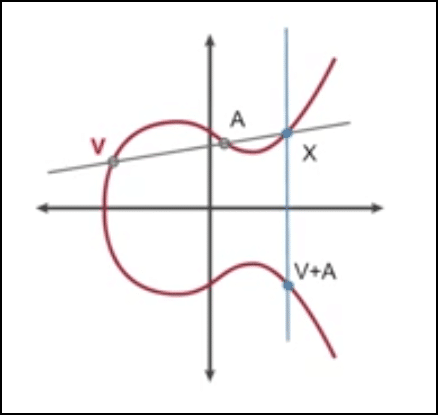 They don’t have the x coordinate given directly to them by the sender BUT they have the values of r and n.
A weak curve may be chosen which can be broken into.